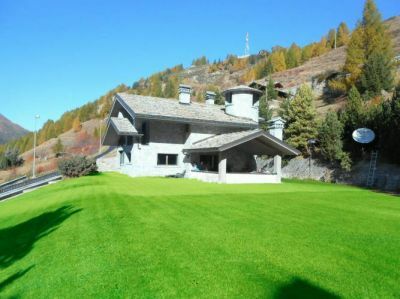 We offer splendid Villa facing Gran Paradiso with a dominant view of the Cogne village, unique in its kind. Building made with first quality materials with high quality finishes in all internal and external environments; built as a first home for private use. The Residence is composed as follows: basement with access ramp to garage for six cars, equipped tavern, boiler room, changing room / laundry, hydromassage area with service, wine cellar, hallway for the aforementioned rooms with access ladder to the upper floors that develops inside a characteristic stone tower visible from the outside. Ground Floor: Large living room with dining room with a dominant central fireplace and glazing in favor of the valley, kitchen with direct exit to the patio on the garden, bathroom and closet. First floor: Three double bedrooms each complete with master bathroom, balconies. Subject: Possibility of additional usable rooms. Complete the private garden as photos of large size all in plan. Independent heating, property prepared for accommodation like B & B or similar. Tractical study, incidence price x Euro per 3000 square meters.